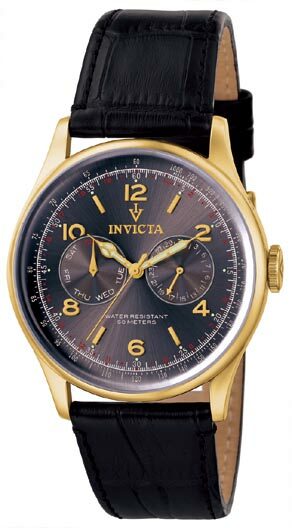 Invicta’s Vintage collection offers the same high quality Swiss quartz and craftsmanship as their other watches. But here’s one important difference. The Invicta Men’s Vintage calf leather quartz 6751 has an elegance and classic styling that’s not possible on dials cluttered with sporty functions. Just like several other pieces of the Vintage collection, this one successfully blends classical European watch making with modern style. Doing away with chronographic wheels and numbered bezels, this watch is a simple and tasteful answer to anyone searching for a watch that’s not too sporty or contemporary. The only thing sub-dials on this one will do is allow you to reference the day of the week and date. A taupe sunray dial is accented with 18kt ionic gold plated hour markers and numbers with Tritnite® hands that offer pretty decent lume in the dark. The average-sized 44 mm case wraps comfortably around your wrist with genuine calf leather that’s adorned simply with square seams. Also, you don’t need to worry about accidently bringing it into the shower with you since it’s rated for 50 meters of water resistance. The Invicta Men's Vintage Classic 6749, which offers the same style without gold details. 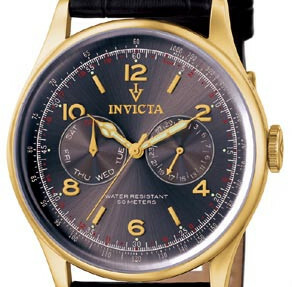 It seems that the Invicta Vintage collection is chiefly geared toward gold and warmer-hued options. But if you like the cooler tones of stainless steel, there are a couple models that are only silver-toned like this one. Additionally, if you want the vintage style but prefer a metal bracelet for the band there are options in this department as well with black, silver, and midnight blue dials. This watch retails for $795. 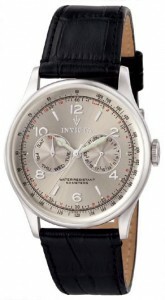 But a quick search for the Invicta Men’s Vintage calf leather quartz 6751 will show online offers around $100. Personally, I think this timepiece has a lot of quality riding along with its European style. This isn’t just a new watch with antique styling. This is a quality watch with a tasteful pairing of the Old World with the New. My only concern is whether it could stand up to abuse. The face is scratch resistant but the crown isn’t protected and it’s hard to say how well the leather band would react to moisture over time. Still, for the money, it’s probably a good value even if you can’t make it last forever.